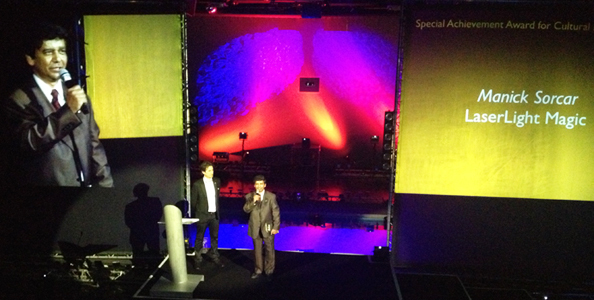 Special Achievement Award for Cultural Enlightenment"
of Dirk Baur, president of MediaLas Electronics GmbH, Germany. (Below) Logo of the 25th ILDA Conference. 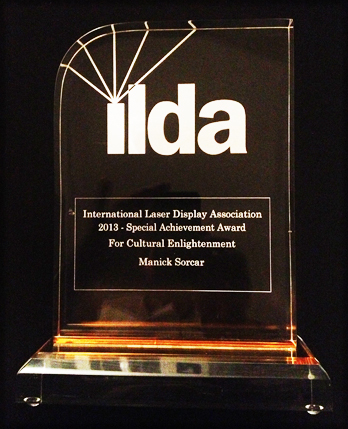 Manick Sorcar was bestowed with the “2013 ILDA Special Achievement Award for Cultural Enlightenment”, at the 25th ILDA Conference in Aalen, Baden-Württemberg, Germany, during the Award Banquet on Wednesday, 6 November. 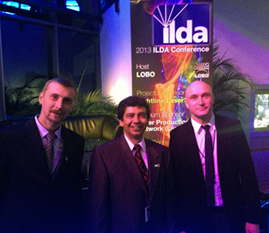 It was held at the LOBO Headquarters - Corporate Host of the ILDA Annual Awards. 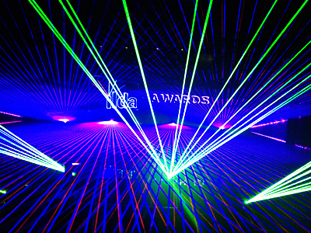 The Special Achievement Award was established by the ILDA (International Laser Display Association) Board to honor achievements, which do not fall into other existing ILDA Award categories. Manick Sorcar was the first recipient of the SAA, which was a double honor for him. “Awarded to Manick Sorcar of LaserLight Magic for exceptional merit in using laser display to celebrate India’s heritage, and to prepare the next generation by introducing a course on laser art and animation and establishing the Manick Sorcar Laser Animation Laboratory at Jadavpur University”. "I am humbled to receive this award. I have been fortunate to receive other awards from ILDA in the past, but this is of special meaning to me as ILDA went outside the box to recognize my contribution. As we all know laser has been the painting brush of the 21st century with which spectacular, mind boggling atmospherics can be made, as has been evident at the 'lase-off' ceremony of yesterday. But I feel, laser can be more than that. It can also be the magic-pen or the media with which a message can be passed, a theme can be carried, a story can be told. Together, it can not only be a feast for the eyes, it can connect with people to illuminate a soul. My laser shows are an attempt to that goal. Produced in English and based on stories or events from India, each is intended to be a 'cultural-bridge' between East and West where the viewers are taken to the other side of the globe and introduced to the Indian culture in a grass-root level for a better understanding, harmony and world peace. 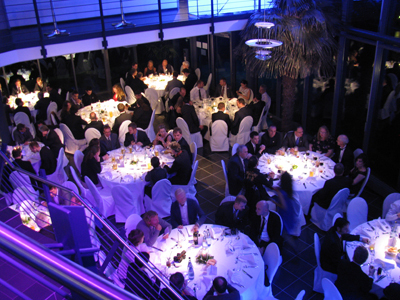 (Left) LOBO Headquarters - Corporate Host of the ILDA Annual Awards — in Aalen, Baden-Württemberg, Germany. In 2006, when I took my laser show to India, it was displayed at 'Nicco Park', Kolkata, the Disneyland of India. The show ran for one month, completing a total of 78 shows, two per day and thrice per weekend. But what touched my heart was to see how dozens of lighting enthusiasts, mostly engineering students would come back stage after each show to see how the strong beam of light was manipulated to be a harmless painting brush to create graphics and atmospherics. When I briefly explained the technique, you could see sparkles in the eyes and hear their exciting discussions already building a story board for their first laser project. But alas! I thought, it is not that easy. They must have a thorough knowledge of the laser technology and safety issues before doing anything - and it must be taught systematically, with a formal educational course and practical training at a qualified school. With that in mind when I approached Jadavpur University - one of the top ranking universities in India, they accepted the offer with open arms. 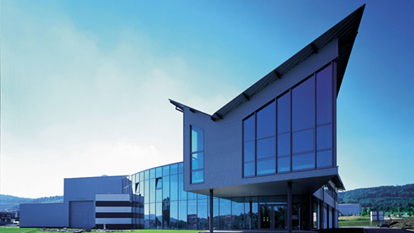 The School of Illumination, Science, Engineering and Design (SISED) could see the potential of it and built a laser laboratory where I donated all the equipment. "Laser Lighting for Art, Animation and Entertainment" course was accepted as a special application of lighting towards an illumination engineering degree. The lab and the classes were formally opened two years ago, where I am a visiting lecturer. It pleases me to see my love for mixing art with science has come to a fruition and opened up an exciting career opportunity for the students in India. 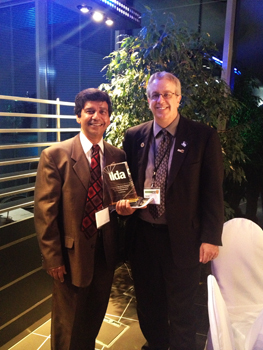 I sincerely thank ILDA for recognizing the effort through this honor, it means a lot to me." This is not the first time ILDA recognized Sorcar’s achievement in innovative use of laser at international competitions. In 2004 ILDA conference at Las Vegas his Dancing with My Soul received a plaque for a Finalist, in 2006 at the annual conference in Rimini, Italy, he was awarded the ILDA Artistic Award for the best use of laser with live performance on stage for his Enlightenment of Buddha, and again in 2008 he received the ILDA Artistic Award for best laser photograph of his laser artwork Reflection – which made to the cover of ILDA’s internationally circulated printed and online magazine, The Laserist. Sorcar’s tie with his Indian cultural programs goes back many years. He first shot to fame in the nineties when his Deepa and Rupa: A Fairy Tale From India, India's first animation mixed with live action, received the Gold Plaque at the Chicago International Film Festival in 1990 and The Sage and the Mouse won the Gold Medal at the International Film Festival of New York in 1993. After this, his Calcutta Forever: A Laser Fantasy was recorded as the first laser-documentary screened inside a movie theatre (Nandan, Kolkata). In 2000, he received the Excellence in Art Plaque from the National Federation of Indian American Associations in New Jersey for his laser shows Dancing with My Soul and India Forever. Hosted by the Indian Consulate General of San Francisco for India’s 61st Republic Day celebration on January 26, 2010, his laser documentary Our Republic’s Birth, which captured India’s history starting from 3300 BCE to its independence from the British and proclamation as a Republic Dominion, was shown at the historic Palace of Fine Arts in San Francisco, California. Sorcar’s latest production “Swamiji”, a laser documentary on Swami Vivekananda stormed India during its four-month tour across the country in 2012, where it was also nationally telecast. The unique laser show, which received rave reviews from the press, media and Ramakrishna Missions is on a tour across the USA as a highly-successful fund-raiser for the SEWA International USA, a non-profit humanitarian organization. In 2012 Sorcar retired from Sorcar Engineering, a Denver-based electrical engineering and lighting firm which did the lighting design for the Denver International Airport concourses, sport centers in Japan, and several Saudi Arabian palaces. He is the author of several popular lighting design texts, which are taught at the universities. He received his M.S. in Electrical Engineering from the University of Washington in Seattle and his B.S. in Electrical Engineering from Banaras Hindu University, now Indian Institute of Technologies (BHU), Varanasi. 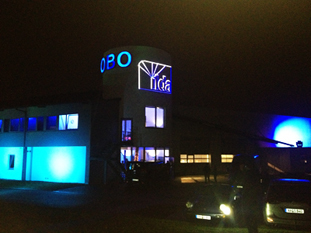 He is now full time devoted in world-touring laser shows with his production team. Sorcar’s art and animation have been the subject of numerous articles, academic research papers, and books. For his simultaneous contribution to art and science, he was acclaimed as "the Renaissance Man of our time" in the book Voices of Colorado: Perspectives of Asian Americans by Nestor Mercado, Elnora Minoza-Mercado, and Alok Sarwal. 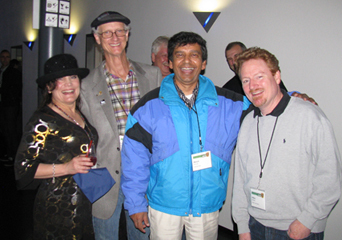 In 2009, he was the subject of the book World of Manick Sorcar: Where Art Becomes Magic by Roma Sur, and in 2010, East Meets West: The Animation of Manick Sorcar by Wendy Luna. Sorcar has received a number of honors, including the Bharat Samman (Honor of India) Achievers Award at the XXI Annual Meet NRI Divas 2011 of the NRI Institute in New Delhi. Manick Sorcar is recorded as the first person in the world to receive the ILDA Special Achievement Award for Cultural Enlightenment.